Tired of cheap plastic chair wheels that are noisy, scratch your floors and gather dust and hair? 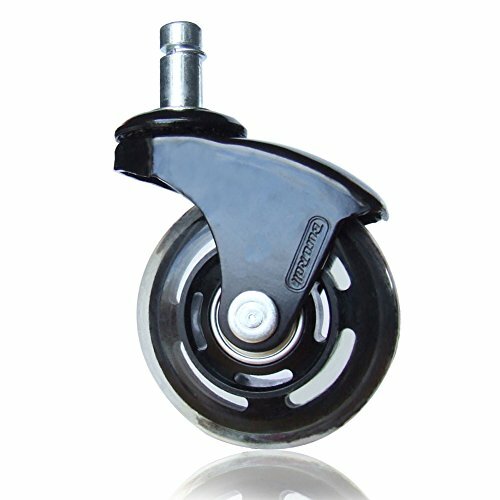 Upgrade to the 2.5" BuroRoll casters today and expect more from your office chair casters! Quality Guaranteed: Backed by manufacturer's warranty so you can shop with confidence! Roll in style with a unique design - Be the envy of your colleagues! The smooth & transparent wheels encased in thick layer of rubber (polyurethane) make gliding effortless and make annoying chair mats a thing of the past. Experience the smooth gliding on hard flooring with no noise whatsoever - your neighbours will love you! Will the 2.5" BuroRoll casters fit my chair? The stem on the casters is 7/6" (11mm) in diameter. This is regarded as the industry standard by major office chair brands and will fit almost all office chairs. There are only a few brands which our wheels are not compatible with, notably IKEA chairs which take wheels with a 10mm stem. If the casters do not fit your chair you can return them with no hassle! Do I need to use a plastic floor mat with these wheels? As the wheels are covered in a thick rubber (polyurethane) covering your floors are protected from scratching and noise caused by standard casters. For very thick carpets or shaggy rugs, however, a chair mat may still be useful for better traction when rolling. SAY HELLO TO PREMIUM BUROROLLS & GOODBYE TO REGULAR OFFICE CHAIR CASTORS - BUROROLL Premium replacement wheels not only give your chair an elegant look but also glide smoothly across hard floors. Say goodbye to your chair mat for good! ANTI-SCRATCH WHEELS and ANTI-ABRASION wheels ensure quiet & steady rolling without the worry of damage to hard floors such as vinyl, hardwood, tiles, laminate, polished concrete etc. PREMIUM QUALITY & STYLISH HOODED DESIGN - Strong steel body supports 50 kg per wheel and 250 kg per set. Looks great on both shiny or black or grey chair bases. BUROROLLS make a superior replacement for standard hard nylon office chair castors that come with most office chairs. If you have any questions about this product by BuroRoll, contact us by completing and submitting the form below. If you are looking for a specif part number, please include it with your message.